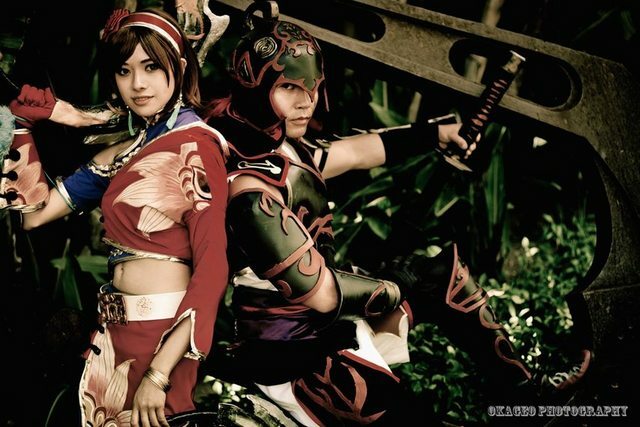 My first attempt at plastic armor was Zhou Tai from Dynasty Warriors 7 for Anime Expo 2011. Was quite the trial but the end result was totally worth it. 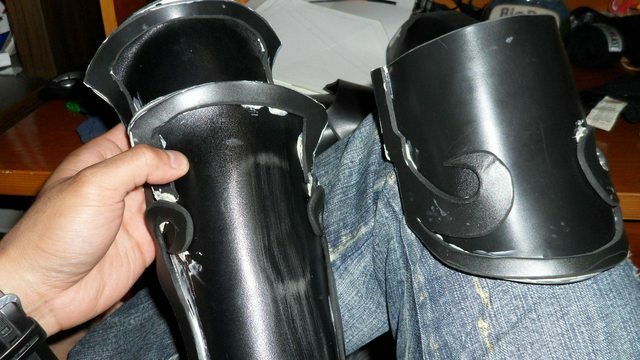 The first step was to cut out the arm pieces and leg pieces from expanded PVC foam (sintra) which is a plastic. I cut it out with a bandsaw and heat formed them with a heat gun. After that was done the knees and the rest of the arm was cut. 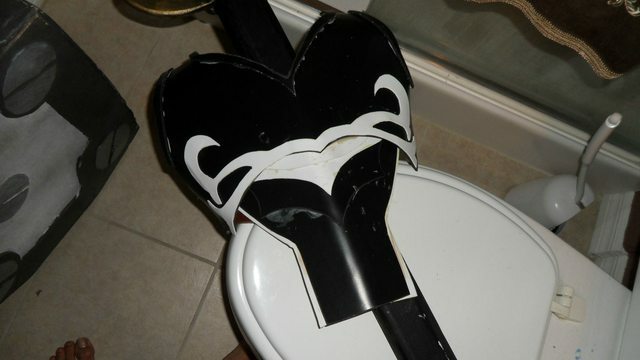 The left piece was darted and then shaped in order to get the domed sort of shape. Chest piece was made the same way as well as the back piece, but the back piece was eventually tossed out due to mobility issues. 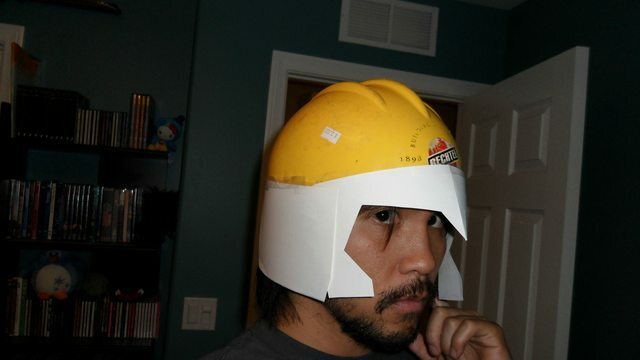 Helmet started life as a construction helmet. Patterned a ring of sintra that would go around it from cardstock. Seemed like a sound plan. 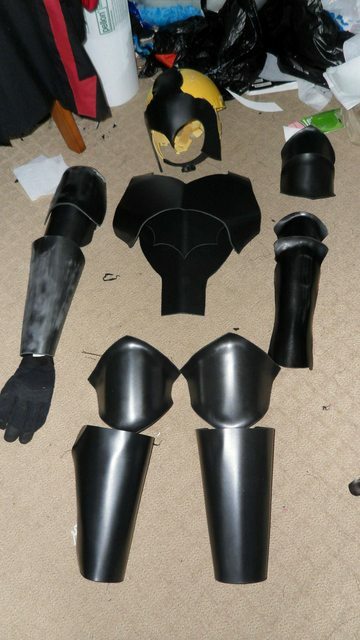 After awhile the armor started coming together structurally. The lipping on the knees and forearm piece was done by heating the plastic to a very high temperature and kneading it almost like a dough to get the nice lip. 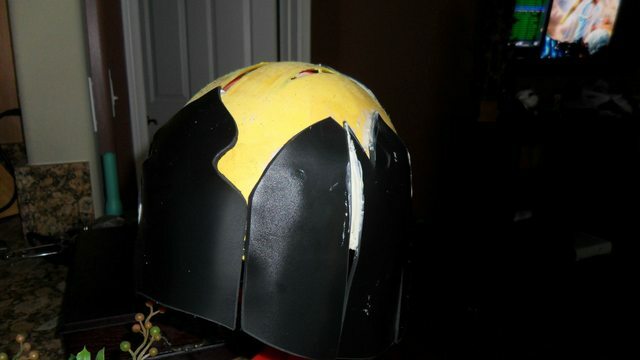 Started adding more sintra to the helmet so that it would have coverage all around it. Started the detailing process. 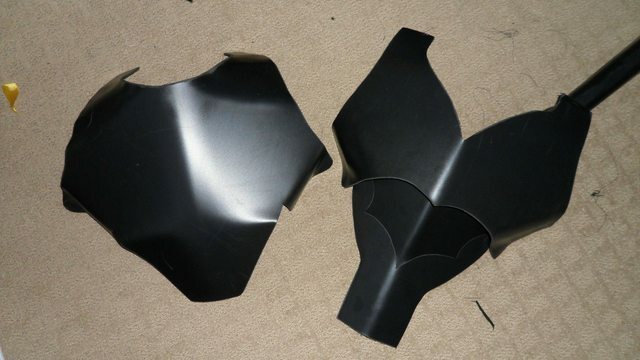 By keeping the initial patterns that I had for the armor I was able to easily to get a pattern for the trim that would go around all the armor. The swirls and curls were cut out of sintra with a bandsaw then glued with liquid nails and super glue. 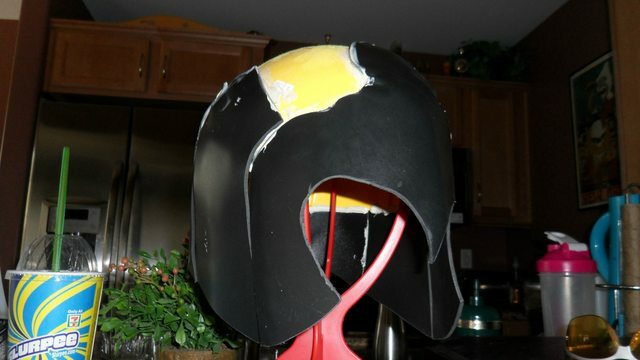 Helmet was filled over with bondo auto body filler to give it a nicer dome shape and sanded like a mad man. More detailing on the chest piece. Looks like a mustache. 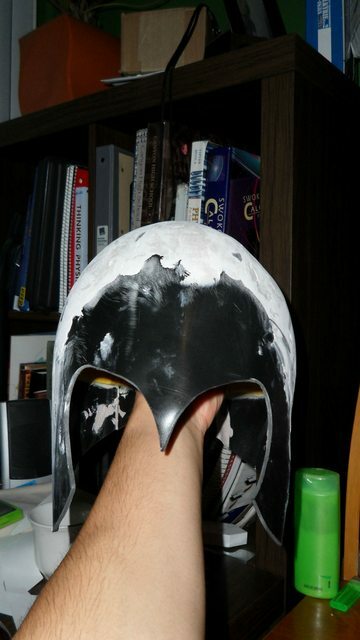 The detailing is a different color because it is a thin styrene, I did not want the detailing on the chestpiece to be particularly thick so thin styrene was used instead. Sorry for the lack of pictures, but towards the end of the project there was a big time crunch. 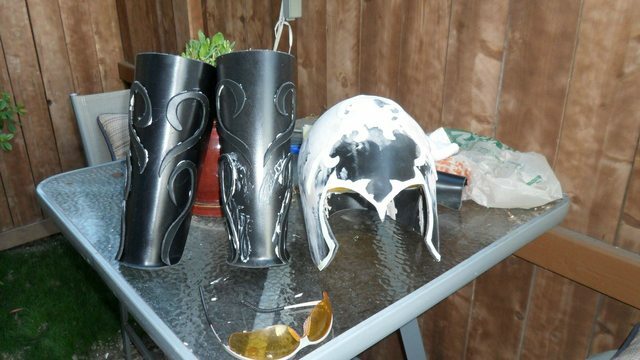 Here is the helmet and some greaves with the detailing in place. Held together with liquid nails! I honestly completely forgot about the sword until a couple of day before. So I had to cobble one together VERY quickly. 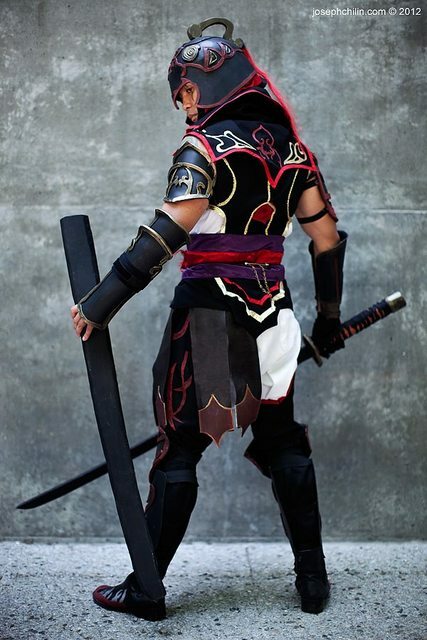 First I got a picture of an actual sword and cut it out of paper to get a good curve. 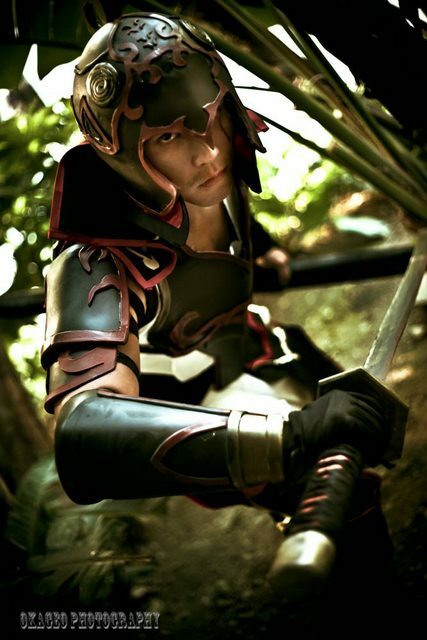 The uniform curve on the katana is integral to getting it to slide in and out of the sheath. 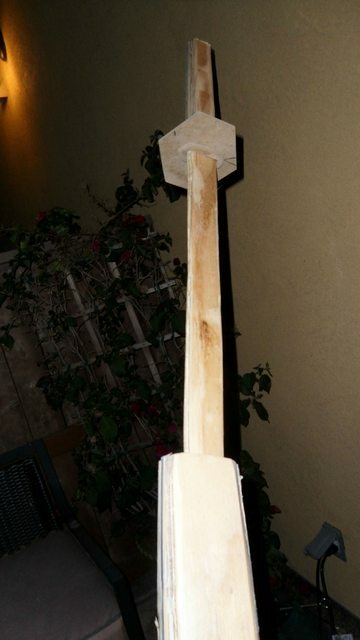 Made the scabbard in a hurry. Scabbards I just make like a box, lined with cloth. 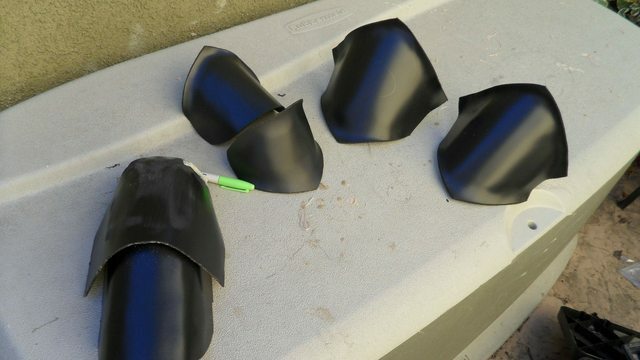 So some steps I didn't photograph since I was rushing like crazy, but the edges were bondo'd to cover and seams, painted with acrylic and spray paints then presto change-o a costume is born! Questions, comments, concerns? Let me know in the comments! Very cool. Two questions for you though. Are the straps you used to hold everything onto you just elastic loops that you slip your arms and legs through? 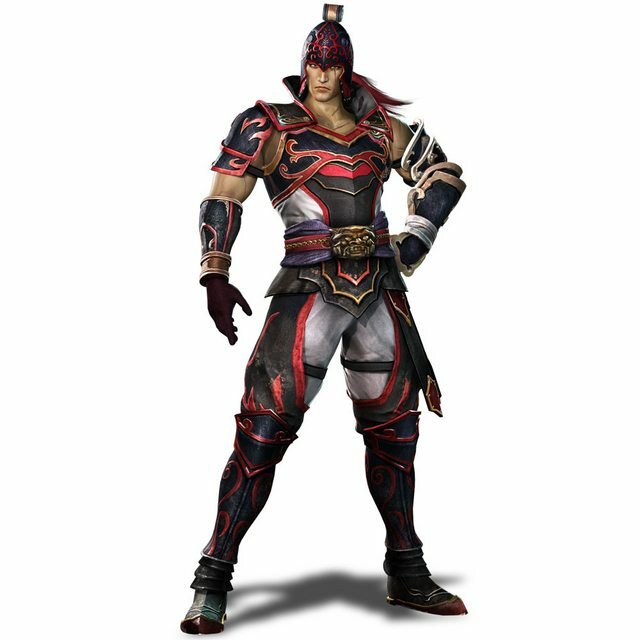 Did you just use more liquid nail to attach the straps to the armor? Yeah the straps I used were just simple elastic. Initially I use hot glue to test fit the straps then once I find there the straps fit best I hit it with E6000 to permanently adhere it. 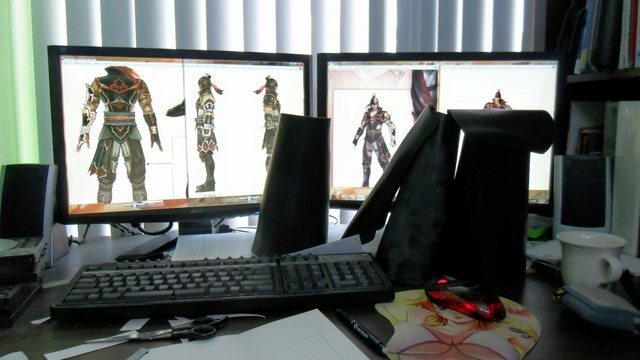 That is a great way to get started with armor. And for those that need plastic without buying sheets of sintra or ABS, people have been known to make some pretty good trash can armor. Your style has definitely evolved and you capture lots of detail. Truth on the trash cans! A lot of good friends do it that way, just glue is problematic on some of them due to the rubber content so they use pop rivets for their joining agent instead! HEAVY METAL! OMFG You are seriously my favorite person for Nami mousepad hahahaha!!! SOMEONE THAT UNDERSTANDS ME!!! I had to draft the patterns myself. They're nothing crazy though. GL!